Outside of a couple of ready-made hits and one lightning in a bottle, studios are struggling to fill the early part of 2015 with anything resembling a box office success, and those that do hit tumble down like a drunken mountain goat (early 2015 Metaphor of the Year contender!). To make things worse, the quality hasn't really been there either, and this weekend continues that trend. The “best of a bad lot”, at least in terms of box office, is Chappie, Neill Blomkamp's latest, and an attempt to prove that he's not the sci-fi version of M. Night Shyamalan. Effectively telling a very similar story to Short Circuit (I'm fairly certain anyone making Johnny Five jokes on set was ejected with prejudice) with a bit of Robocop thrown in, it stars Dev Patel as a robotics engineer who recovers a police bot, the first to develop a true artificial intelligence, and attempts to protect him from various interested parties that want to capture, control and/or destroy him. That includes robotics CEO Sigourney Weaver, and rival engineer Hugh Jackman, who thinks the burgeoning AI threatens his own highly militarized drone soldiers. And, in a stunt casting twist, the members of Afrikaans rap group Die Antwoord. Go figure. Blomkamp made a big splash with his 2009 debut District 9, a race allegory that doubled as a crackerjack sci-fi action film and garnered a Best Picture nomination. His followup, 2013's Elysium, didn't fare as well either in the box office or with critics despite the star power of Matt Damon. 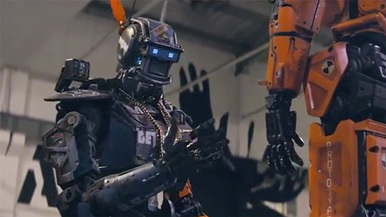 Chappie is pitched as a change of pace for Blomkamp, leaning more towards the comedy than the action, with some heavy handed moralizing and metaphorical reaching that weights the whole thing down. Just three features in, Blomkamp is still riding the wave of his debut and the inherent good feelings therein. The bloom is coming off the rose, and without a similar size hit or critical success, he could find himself pushed outside the group of directors that could be used to sell films. He's still a hefty creative force, but then so are the Wachowskis, so there you go. That it's largely a comedy seems to be avoided in the ads, and that bait and switch tactic is never a great idea. I'd look for a meagre $17 million this weekend, and for Blomkamp to have to do so serious soul searching about what his next project should be. People searching for a second side to Dev Patel can check out The Second Best Exotic Marigold Hotel, the sequel to the sleeper success story from 2012. Grossing $46 million on a $10 million budget and an old-fashioned limited expansion release pattern, it starred a cast of elderly Brits led by Judi Dench and Maggie Smith. Set in a retirement resort in India, it follows the cast in a life-affirming story about enjoying the later years of your life and finding love and/or companionship. This second film is... more of that, then – with the addition of David Strathairn as an American visitor to the resort. High drama, this.